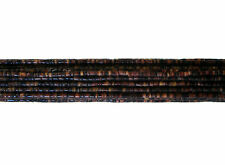 CRL227 Glossy Black Bamboo Coral Medium 12mm Cupolini Gemstone Beads 15"
Shape: Freeform Cupolini. Bamboo coral is a type of sea coral and can found in the waters off the coast of. Gemstone: Bamboo Coral. The skeleton can be polished & dyed or bleached for a natural look. 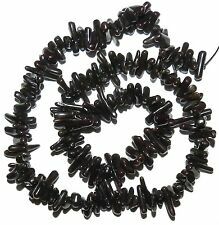 This Black Pen shell heishi beads are originally found in the beautiful island of the Philippines and manufactured in Cebu City. The luster is 'Superior', the matching 'Excellent', the surface quality is 'Excellent'. 10mm South Black Sea Shell Pearl Gemstones. Round Beads Necklace 18" AAA Grade. (Professional Hand Knotted By Double Silk Threads Between Each shell Pearls). MP422 Black w Silver Metallic Drawbench 20mm Flat Round Mother of Pearl Bead 15"
Chief sources of mother of pearl are the pearl oyster, freshwater pearl mussels, and abalone. It is very strong, resilient, and iridescent. Nacre appears iridescent with different colors of light being reflected at different viewing angles. These beads are perfect for your necklace project or any jewelry making needs. 10mm Huge Rare Real Bright Black AB Color South Sea Shell Pearl Loose Beads 15 "
Style: beadsMaterial :shell pearlSze:8mmCondition: new. Due to the difference between different monitors, the picture may not reflect the actual color of the item. We believe that a good communication will be helpful for solving the problems. 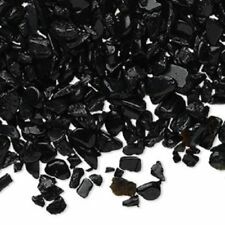 New ListingMP1550 Black Large 15mm Tri-Tip Nugget Mother of Pearl Shell Beads 16"
MP1111 Black Diamond Nugget 14mm - 20mm Mother of Pearl Gemstone Shell Bead 15"
Trending at $6.85eBay determines this price through a machine learned model of the product's sale prices within the last 90 days. Jewelry Making Beads 10x30mm Marquise MOP Shell Gemstone Spacer Craft Strand 15"
Stone: natural lip shell. Shape :filigree peace sign. Quantity: 1 Pendant. Drill :top drilled. you will recieve one similar to the photos. MP2351 Silvery Black 17mm Diamond Marquise Mother of Pearl Shell Beads 15"
MP1155 Black 8mm - 9mm Tri-Tip Nugget Mother of Pearl Gemstone Shell Beads 15"
Highly polished. Beautiful finish - drilled. Drilled nicely for necklaces, bracelets, earrings, charms, or pendants. You can match them up in pairs for earrings. 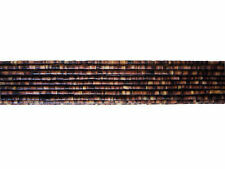 MP1550 Black Large 15mm Tri-Tip Nugget Mother of Pearl Shell Beads 16"
New ListingMP1155 Black 8mm - 9mm Tri-Tip Nugget Mother of Pearl Gemstone Shell Beads 15"
HIGHEST QUALITY GRADUATED PEN SHELL STRANDS. 16" STRAND. PRICE IS PER STRAND. Beautiful Round Chinese Mussel Shells. Material: Chinese Mussel Shell. Range : 20mm. Use: Economical & lightweight, they easily dangle from earrings & necklaces for fabulous jewelry pieces. Shell Beads. Gemstone: Chinese Mussel Shells. Use: Economical & Lightweight, they easily dangle from earrings & necklaces for fabulous jewelry pieces. Range : 10mm. Shell Beads. Shape: Round Coin. Be Dazzlin Beads. Beautiful Round Chinese Mussel Shells. Material: Chinese Mussel Shell. Range : 40mm. Use: Economical & lightweight, they easily dangle from earrings & necklaces for fabulous jewelry pieces. Shell Beads. 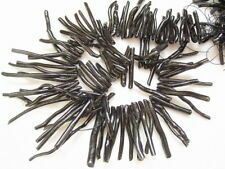 This Item is a 30 pc lot of Buffalo Horn Beads. The Color is Black Plain Black. These Beauties are brought to U from India and are Declared as Indian Buffalo Bone. The Black Olive sea shell that is used to create these beautiful beads are hand picked straight from the beaches of the Philippines. It has the finest quality that an artist could ever ask for. 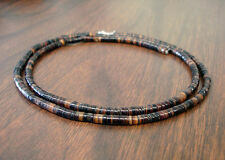 Item Type: Blacklip mother of pearl. Item Size: 90mm(3 9/16"). US: FREE FREE. Rest of world: N/A N/A. One gorgeous and striking handmade focal or pendant bead, black-lip (natural) and mother-of-pearl (natural), 46x27x1mm-47x29x2mm oval. 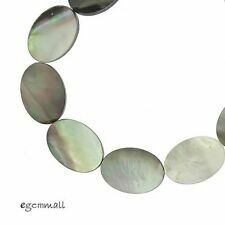 Black lip mother-of-pearl shell ranges in color from light grey to black with a rainbow iridescent sheen of silver to pale green or pink. This dramatic material pairs with white mother-of-pearl for beautiful components. The reverse side of the component is mother-of-pearl. Use with red coral for designs that are black and white and red all over. This listing is for a 5 inch strand of black bamboo sticks. Size: 16x13mm. Design front and back. Thick round coin. Qty: 4 pcs bead. More about the beads: Each piece may vary in size, color/shade, style and shape based on the natural beauty of the gemstones / beads. Stone: turquoise. Quantity: 7 beads. Shape :cross. Drilling :lengthwise. You will receive 1 Vintage Bone Carved Rabbit Handmade Chinese Tube Bead. Bead measures 31mm. Long by 12mm. wide by 9mm. thick. Approx. 1.5mm. hole. Each Handmade Bead is Unique and May Vary in Size & Color Slightly. New Unused Vintage Stock - NOS - New Old Stock. Embedded MOP Beads. Encased in black lucite resin. Standard size bead hole. Loose Beads -.